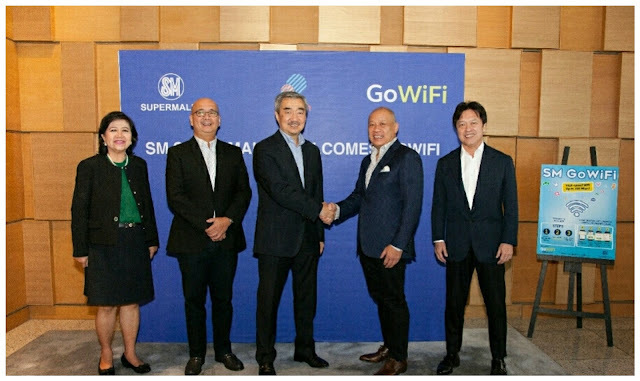 Two of the most loved brands, SM Supermalls and Globe have teamed up to provide mall goers access to high-speed internet services, and together, bringing new and extraordinary experiences in SM malls across the country. 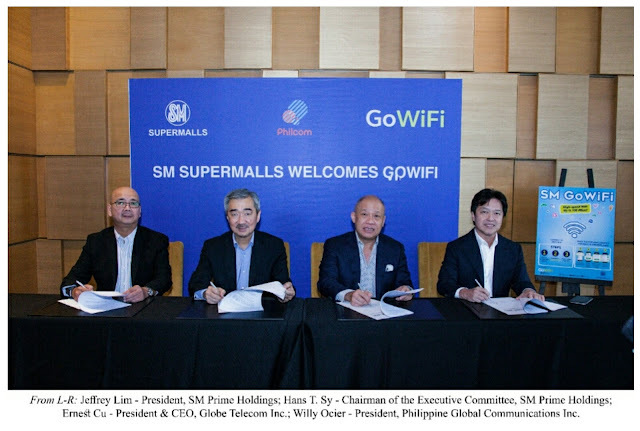 SM Supermalls together with Globe Telecom Inc., boosts free internet access in selected SM Malls nationwide starting November this year. From L- R Annie S. Garcia, Preaident Shopping Center Management Corporation; Jeffrey Lim, President SM Prime Holdings; Hans T. Sy, Cgairman of the Executive Committee, SM Prime Holdings; Ernest Cu, President and CEO, Globe Telecom Inc.; Willy Ocier, President Philippine Global Communications Inc. Shoppers and mall goers will be able to access everything they need online with speedy and reliable internet making their mall-going experience enjoyable, seamless and convenient.